Cognition enhancing or neuroprotective compounds for the treatment of cognitive disorders: why? when? which? Lockhart BP, Lestage PJ. January 2003. 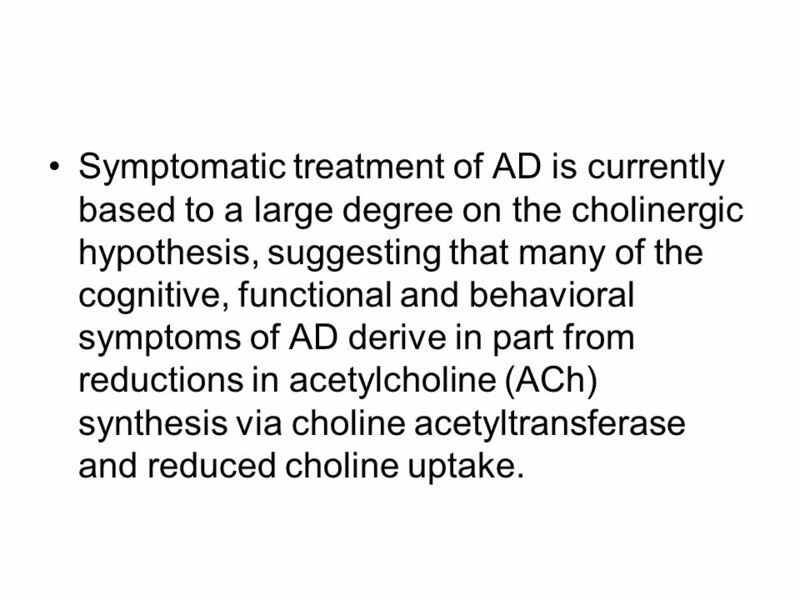 3 Symptomatic treatment of AD is currently based to a large degree on the cholinergic hypothesis, suggesting that many of the cognitive, functional and behavioral symptoms of AD derive in part from reductions in acetylcholine (ACh) synthesis via choline acetyltransferase and reduced choline uptake. 5 These drugs give similar, moderate improvement in randomized, controlled trials within the first 6 months of treatment. 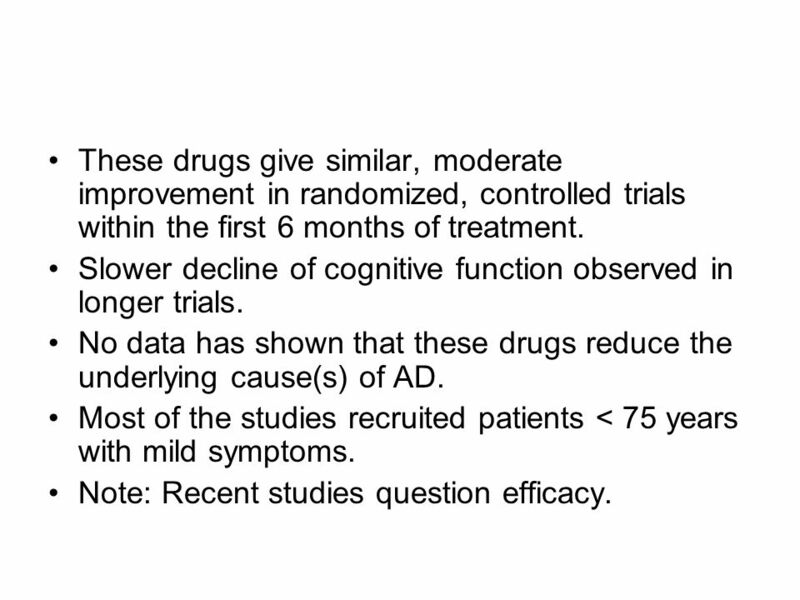 Slower decline of cognitive function observed in longer trials. 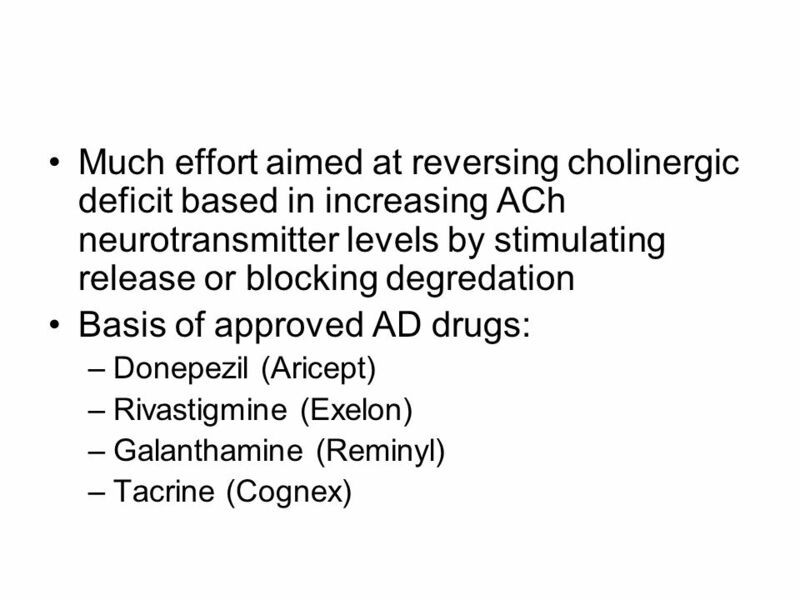 No data has shown that these drugs reduce the underlying cause(s) of AD. Most of the studies recruited patients < 75 years with mild symptoms. Note: Recent studies question efficacy. 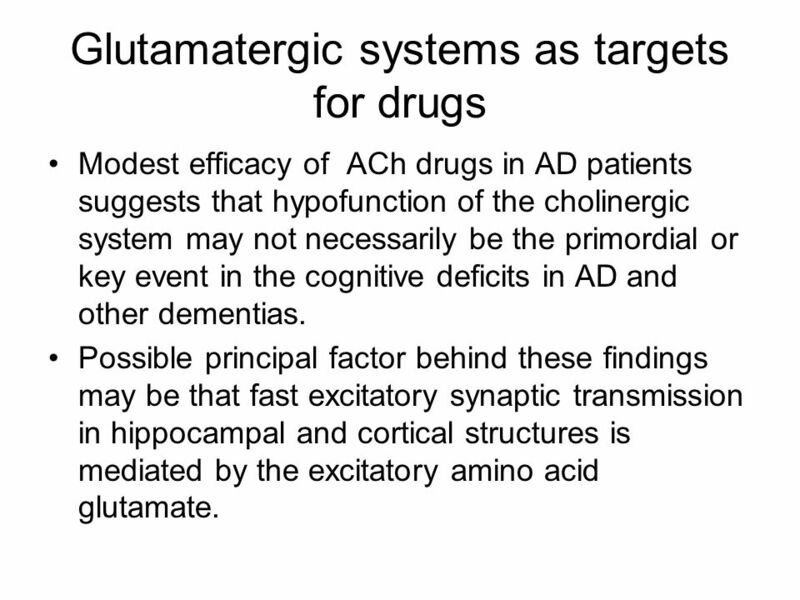 6 Glutamatergic systems as targets for drugs Modest efficacy of ACh drugs in AD patients suggests that hypofunction of the cholinergic system may not necessarily be the primordial or key event in the cognitive deficits in AD and other dementias. Possible principal factor behind these findings may be that fast excitatory synaptic transmission in hippocampal and cortical structures is mediated by the excitatory amino acid glutamate. 7 The glutamate receptors include the NMDA family and AMPA family. Drug strategy has focused on NMDA and AMPA. 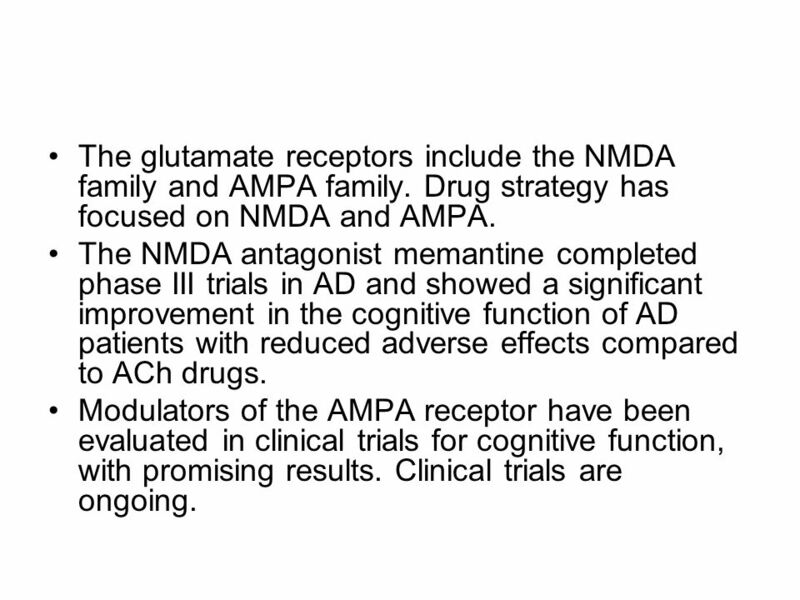 The NMDA antagonist memantine completed phase III trials in AD and showed a significant improvement in the cognitive function of AD patients with reduced adverse effects compared to ACh drugs. 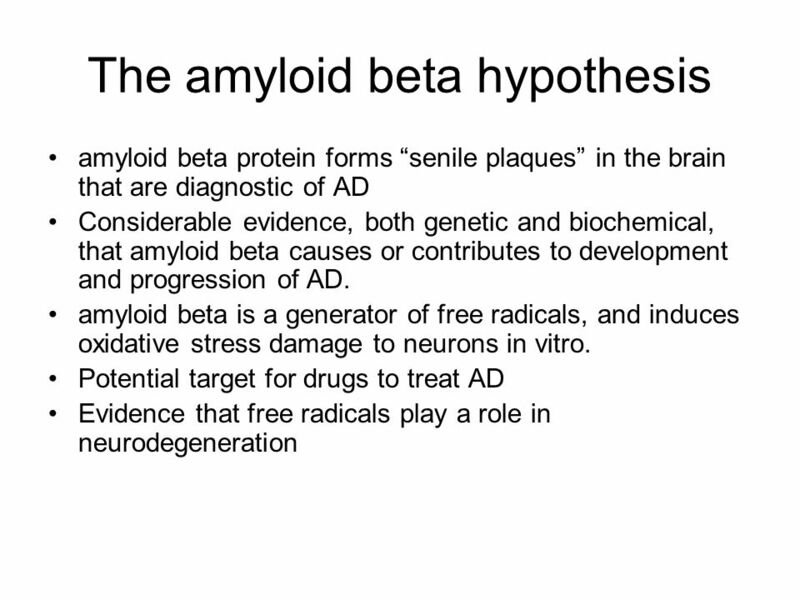 Modulators of the AMPA receptor have been evaluated in clinical trials for cognitive function, with promising results. Clinical trials are ongoing. 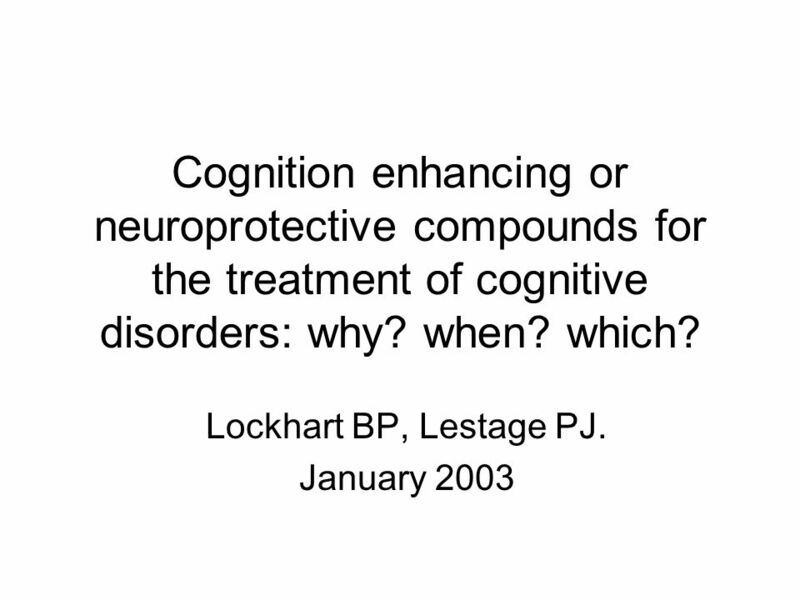 Download ppt "Cognition enhancing or neuroprotective compounds for the treatment of cognitive disorders: why? when? which? Lockhart BP, Lestage PJ. January 2003." Curtin University is a trademark of Curtin University of Technology CRICOS Provider Code 00301J Curtin University is a trademark of Curtin University of. Neurotransmissions in the Central Nervous System Prof. Alhaider. ‘Improving health and wellbeing through Research’ Preston Football Club 17 th October 2014 Improving health and wellbeing through research – October 2014. Cellular, Behavioral, and Computational Investigations of Dopamine Modulation of Prefrontal Cortical Networks Jeremy Seamans. Management of Early Dementia Dr Eleanor Mullan Consultant Psychiatrist Mental Health Services for Older People South Lee, Cork Feb 2011. This is only for personal educational purposes. AD Research Update Steven H. Ferris, PhD Friedman Professor and Director NYU Alzheimer’s Disease Center Silberstein Alzheimer’s Institute Center for Cognitive. AGEING, MEMORY LOSS AND ALZHEIMER’S DISEASE? Dr JANE HECKER Dept Internal Medicine, Royal Adelaide Hospital College Grove Hospital. Introduction to the CNS 5/07/neurons-and-how-they-work- animationhttp://biosingularity.wordpress.com/2007/0. Neurotransmission and the CNS BY PROF. Azza El-Medany. OCD. Neurochemical dysfunction (abnormalities in serotonin (5-HT), dopamine (DA), and glutamatergic transmitter systems) Neurochemical dysfunction (abnormalities. MCB 135K: Discussion March 2, General Info Mid-Term I: –Avg 87 –Std. Deviation 10 –Re-grades by next Wednesday Include a cover sheet that addresses. Alzheimer’s Disease Nicotine’s relationship and contribution to dementia. 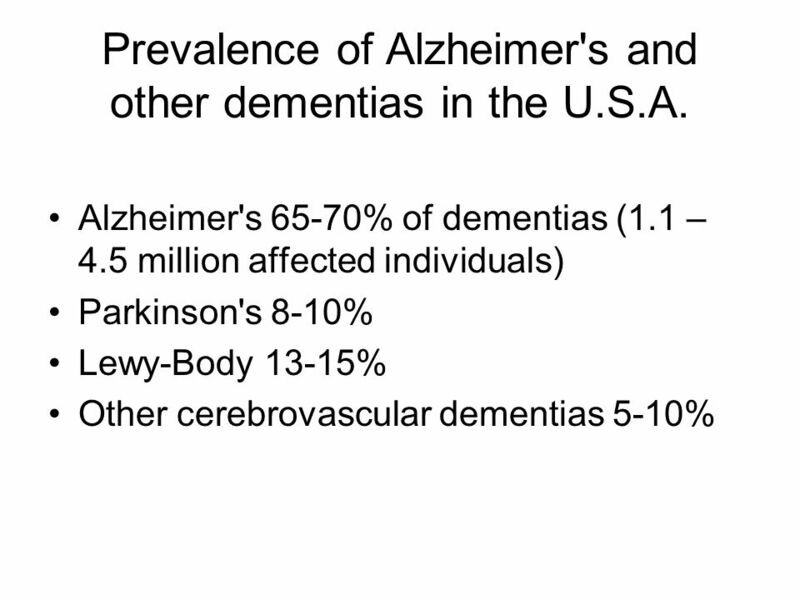 Alzheimer’s Disease Find group of ~4 students ~ 10 minutes Discuss the following personal family connection to AD (if willing only) observations/experiences. Dementia Drugs: Mainstream and Alternative Medicines Susan Kurrle. Treatment Options for Dementia Deb Bynum, MD Division of Geriatric Medicine University of North Carolina. Neurotransmitters in the Central Nervous System By Prof. A. Alhaider Dept. of Pharmacology. Cognitive Enhancers. Dementia A syndrome due to disease of the brain, characterised by progressive, global deterioration in intellect including: Memory.